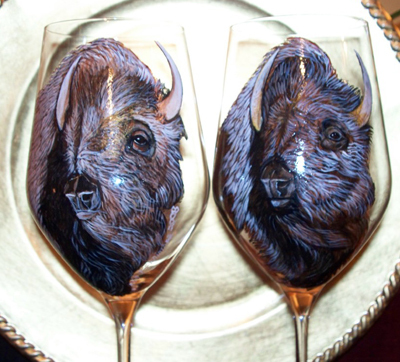 The glasses take three days to a week for each set to be painted, cured and ready for shipment. A triple coat of sealant produces a durable hand-washable surface, so with proper care they can last a lifetime. They should never be soaked in water - or cleaned in the dishwasher. The prices start at $195 for a pair with no discounts for ordering more. The prices are determined by the difficultly of the painting on it. So far Peg has painted wolves, foxes, buffalo, bears in water, but she is able to paint any animal or landscape. "Pine cones with snow is a popular choice this year", says Peg Fennimore, Artist.